The author hopes people will take inspiration from his experience. 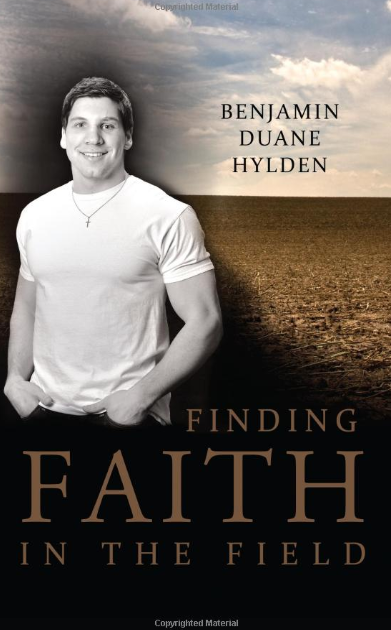 With the growing number of people suffering from mental illness especially depression, Benjamin Duane Hylden, the author of “Finding Faith in the Field,” shares his story in his book about his personal experience that almost made him lose his faith and life. When he was 16 years old, he was on his way to his hometown of Park River, ND for physical therapy. Running late and driving too fast, he lost control of his car on ice, flipped the car and was thrown out the passenger’s door-plunging face first into an icy field. Hylden’s face and body were crushed beyond recognition, along with his dreams of being a future basketball star. After being found by his parents just minutes later and rushed to a nearby hospital, he was given only a 5% chance of survival due to the severity of his injuries. However, as he dramatically surpassed the expectations of his doctors, he miraculously escaped his supposed death sentence and began on a remarkable journey of faith and recovery where he endured many life hardships, which ultimately taught him what truly matters most in life. Giving up is not an option in life, and if one needs inspiration, he/she only needs to make his/her way to the 2019 LA Times Festival of Books on April 13–14, 2019, to check out Hylden’s book “Finding Faith in the Field” where it will be on display. You can also purchase a copy of his book at www.benhylden.com, Barnes and Noble, Amazon, and many other retailers. Benjamin Hylden grew up on a dairy farm near Park River, ND, where he first found his faith in Christ and love for sports. The 28-year-old’s experience when he was 16 years old changed his life and made him a big believer that anything is possible for the one who believes. Through that belief, he released “Finding Faith in the Field” exactly 7 years after his accident to show his readers that life is not always easy, but it is still worth living. Upon it’s release, a career as an inspirational speaker and the creation of his clothing line Purified began to take form. Now along with his speaking career and clothing line, Benjamin has also started a health company with Dr. Prasad Sawardeker, MD, called Purified Health.